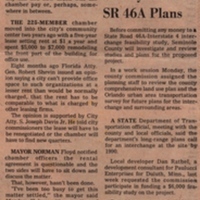 A newspaper article from The Seminole Star discussing the Altamonte Springs-Casselberry Chamber of Commerce's leasing issue with the city government. The Chamber of Commerce had been paying $1 a year to rent out a city-owned building. Florida Attorney General Robert Shevins, who said the terms of the agreement were to be renoegoitated, because the city could not charge the Chamber of Commerce lesser rent than they would any other organization. Original newspaper article: "CofC, City to Meet on Building Lease." The Seminole Star: Private Collection of Sue Blackwood. Digital reproduction of original newspaper article: "CofC, City to Meet on Building Lease." The Seminole Star. Originally published by The Seminole Star. Copyright to this resource is held by The Seminole Star and is provided here by RICHES of Central Florida for educational purposes only. "Altamonte Springs, Florida." Altamonte Springs, Florida. http://www.altamonte.org/. Robison, Jim. Altamonte Springs. Charleston, SC: Arcadia, 1999. Shofner, Jerrell H. A History of Altamonte Springs, Florida. Altamonte Springs, Fla: City of Altamonte Springs in association with Tabby House Charlotte Harbor, Florida, 1995. “CofC, City to Meet on Building Lease.” RICHES of Central Florida accessed April 21, 2019, https://richesmi.cah.ucf.edu/omeka/items/show/5215.